Ever since I bought my own home nearly a year ago, I’ve become increasingly interested in making it smart. Right off the bat, I feel like I should clarify what that means to me. The ability to turn some lights on or off with an app is not smart, in my opinion – the smart way of controlling lights is by flicking a switch conveniently located in the room you wish to illuminate. A smart home needs to be much more intelligent. It’s about automation. It’s about the home being able to notify me if something is happening that I need to know about. It’s about being able to accomplish things with minimal difficulty, not adding complexity and more steps. That’s where off the shelf “smart home” solutions really started to fall down for me. I could spend hundreds or maybe even thousands of dollars, for what? The ability to turn on my living room lights while I’m still at the office? Why would I ever need to do that? Nevertheless, the lack (in my opinion) of a pre-packaged, useful, holistic solution that accomplished my vision of what a “smart home” should be didn’t deter me from tackling things bit by bit. It started with our burglar alarm. It has internet connectivity which sends me alerts in the event that something unexpected is happening, and lets me arm or disarm the system from my phone – which I actually do find useful. Next up was our thermostat. The one that was installed when we bought the house was an old-fashioned one with a simple mercury switch inside. You set the temperature, and that was it. We replaced that about a month ago with something programmable (it doesn’t need to be as warm in here at night as it does during the day; it doesn’t need to be as warm if nobody’s home), and I took the opportunity to get one with WiFi so I can set the temperature remotely. That’s not useful in and of itself, but if you take that functionality and look at it in the context of my wider vision then the thermostat is certainly something I’d like to be able to programmatically control. It was around this same time that I discovered home assistant, and now my dream is starting to come alive. 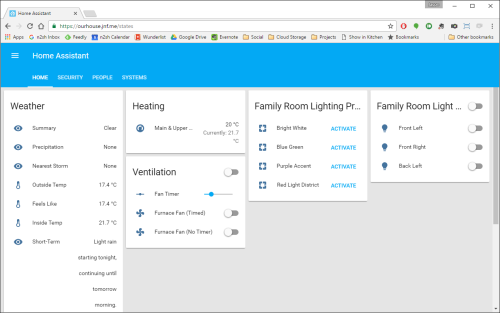 Home Assistant is an open-source project that runs on a variety of hardware (I was originally running it on a Raspberry Pi, and I’ve since switched to running it in a Docker container on our home server). It has a ton of plugins (“components”) that enable it to support a variety of products – including our existing alarm, thermostat, streaming media players, and others (including, somewhat ironically, the colour-changing lightbulbs we have in our family room). It includes the ability to create scripts and automations, it uses our cellphones to know our locations, and can send us push notifications. My initial setup was all about notifications. If we both leave the house but the burglar alarm isn’t set then it tells us (and provides an easy way to fix the issue). If we leave one of the exterior doors open for more than five minutes, it notifies us (or just one of us, if the other is out). I also created a dashboard (that you may have seen in my last post) to display some of this stuff on a monitor in my office. Since installing the thermostat I’ve added more automation. The time we go to bed isn’t always predictable, but when we do go to bed we set the alarm. So, if it’s after 7pm and the alarm goes from disarmed to armed, the thermostat gets put into night mode. If nobody is home then the temperature gets gradually turned down based on how far away we are. If nobody is home at dusk then it turns on some lights and streams talk radio through the family room speakers to give the impression that someone is. This stuff meets my definition of smart, and I’m barely scratching the surface. The open nature of the platform not only means that I’m not tied to a particular vendor or technology, but also means that I can add on to the system in a DIY way. Which is exactly what I’m going to do. I’ve bought some NodeMCU microcontrollers which are WiFi enabled, Arduino IDE-compatible development boards designed to the basis for DIY electronics projects. Watch this space, because over the coming months I’ll be connecting our doorbell, garage door and laundry appliances to Home Assistant. I’ll be learning as I go, and I’ll share the hardware and software.